Introduced by Apple in iOS 5, iMessages service allows iPhone users to send and receive Text Messages, Photos, Videos, Group Messages and documents for free. In this article we will be taking a look at why your iPhone sometimes ends up sending an iMessage as a SMS Text Message and how to prevent this from happening. The Messages app on iPhone is capable of sending both iMessages that make use of Apple’s servers and regular SMS Text Messages that make use of your carrier’s network. A major difference between the two is that iMessages are free to use where as regular SMS/MMS Messages go through your Cellular Provider’s network and will cost you money. By default iMessages are routed through Apple’s servers and are designed to make use of any available internet connection (WiFi or Cellular) to quickly send your Messages. All this works fine as long as an active Internet Connection is available for the Message to travel through Apple servers to the recipients iPhone. However, when the recipient moves to an out of service area, turns off the iMessage service for some reason or when Apple servers are having a problem, the Messages app on your iPhone tends to deliver your iMessage as a regular SMS text message. This might be a glitch in the Messages app or something intentionally designed in the Messages app to make sure that your Messages are delivered as quickly as possible. Whatever may be the reason, there is a way to Prevent iMessages from being delivered as regular SMS Text Messages on your iPhone. 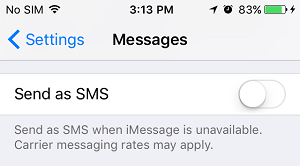 Follow the steps below to prevent the Messages app on your iPhone from sending iMessages as regular SMS/MMS Messages. 2. Next, tap on Messages. 3. On the next screen, Disable the option for Send as SMS by moving the slider to OFF position (See image below). Simply turning off “Send as SMS” option is good enough in most cases to prevent your iPhone from sending iMessages as regular Text Messages. Note: Disabling “Send as SMS” option does not prevent you from sending text messages to Contacts who do not use an iPhone. You can make use of the following tips to make sure that your iPhone is sending your messages as iMessages and not regular SMS/MMS Messages that might cost you money. 1. 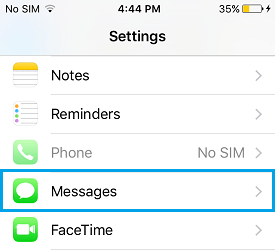 Make Sure that you have Enabled iMessages on your iPhone and disabled the option to Send as SMS, using steps as described above. 2. 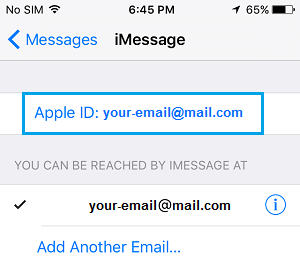 Confirm that your iCloud Account and “You Can be Reached By iMessage At” address is correctly set up on your iPhone by tapping on Settings > Messages > Send & Receive. 3. 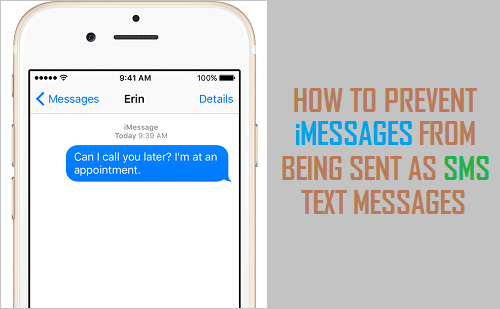 In case you are having difficulty in sending an iMessage to a particular Contact, make sure that you are sending the message to the recipient’s Email Address only and not to the Phone Number. This is a sure way of ensuring that your Message will only be sent as an iMessage. 4. When sending a Message on your iPhone, make sure that you are not seeing a Green send button (See image below). A Green send button indicates that your Message is going as a regular SMS Text Message, where as a Blue button indicates that your Message is going as an iMessage (See image below). 5. If your recipient has an iPhone and you are still having problems sending an iMessage, confirm that your recipient has enabled iMessage on his/her device. It is likely that your Contact does not know about iMessages being free and may not have Enabled iMessage service on his/her device. 6. Like any other service iMessages might be experiencing outages, you can take a look at this support page by Apple to see the current system Status of Apple services.